NIA CHARLESTOWN NEVIS (September 04, 2015) — Premier of Nevis and Minister responsible for Disaster Management Hon. 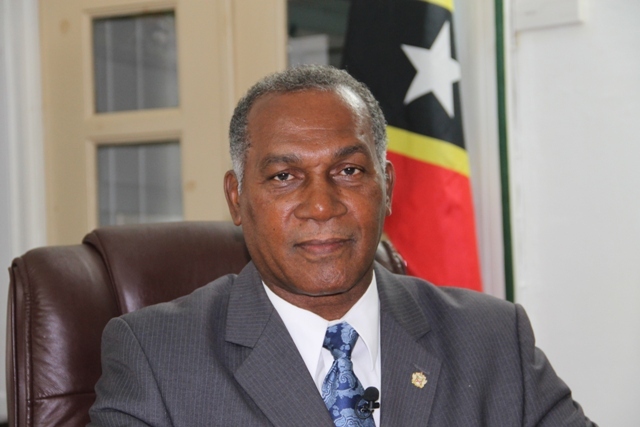 Vance Amory, urged Nevisians and residents on the island to take precaution and be in a state of preparedness, as the island and the region goes through the hurricane season. Mr. Amory made the call when he spoke to the Department of Information at his Bath Hotel Office on August 03, 2015. He was at the time referring to the loss of life and devastation in the Commonwealth of Dominica as a result of the passage of Tropical Storm Erika there on August 27, 2015. “I just want to advise us as the Leader of this government, knowing what happens when we have a storm and we have damage sustained. I want us to be very careful that if ever or whenever there is a threat or warning of a storm let us take precautions. The government itself will do what it can to ensure that we are in a state of preparedness but I want every individual to do so,” he said. Mr. Amory noted that the passage of the tropical system also brought into sharp focus the issue of the of the Caribbean island’s vulnerability to natural disasters. He expressed the view that financial institutions such as the International Monetary Fund (IMF) should recognise the region’s vulnerability. He said he raised the issue with a top official of the IMF who is responsible for Caribbean Affairs at a meeting regarding the Nevis economy on September 02, 2015, at the Four Seasons Resort. “They [IMF] need to take a serious look again at the manner in which they decide to elevate countries to the level of not receiving concessionary grants and loans because we are a vulnerable region and we saw what happened to Dominica. “In one hour in one day 30-something lives lost, tens of millions of dollars in damage and destruction to infrastructure, none of which was predictable or expected,” he said.